The Turkish defence minister said that Ankara seeks a dialogue at every level and conducts talks and contacts with its neighbours, but will give the necessary response if provoked. Turkish Defence Minister Hulusi Akar has once again issued a warning to Greece and Cyprus to avoid “provocations” in the Aegean and Eastern Mediterranean – which Akar and Tayyip Erdogan refer to as “our blue fatherland”, with more than a touch of irredentism – as Turkey will be forced to respond. Ankara is disputing the right of the Republic of Cyprus to exploit the offshore gas deposits in its Exclusive Economic Zone and has repeatedly declared that Greece and Cyprus should do nothing in the Aegean and Eastern Mediterranean without Ankara’s consent. “Nobody should attempt to test our resolve in defending our rights and just positions, which are based on international and bilateral agreements and history,” Akar told a military gathering. “We are absolutely decisive on this issue. We have exhibited our determination and nobody should doubt that - despite our good will – we shall do whatever is necessary to defend our rights and just positions and we shall respond,” Akar, the former chairman of Turkey’s Joint Chiefs of Staff, said. 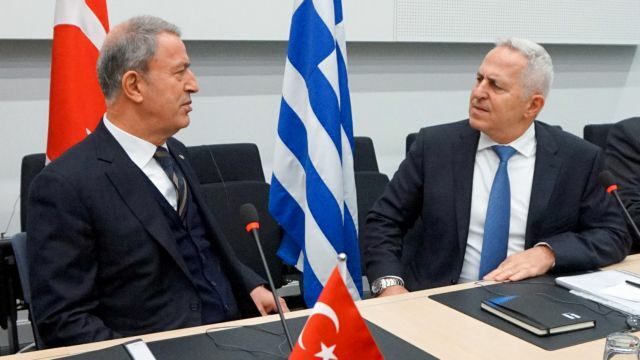 The Cyprus daily Phileleftheros quoted Akar as saying that Turkey seeks a dialogue at every level and conducts talks and contacts with its neighbours, but that it is at the same time prepared to give the necessary response if provoked. Greece’s position for decades has been that the only issue up for negotiation with Ankara is the delimitation of the Aegean continental shelf, and Athens has constantly rejected Turkish demands for a no-hold-barred dialogue on Ankara’s Aegean claims.